''Boko Haram attacked fishermen at Kafa village yesterday [killing] four people then throwing them into the river,” a resident Kaka Sadiq said. Damn!! Devils in human form! Kiaaaa sooo lord hv mercy. Chiaaaa ds is too much o. When will all these killings stop? God have mercy. God save us from terrorism. OMG! I can't wait to hear the last of this evil, may their souls rest in peace. Hmmm may their souls rest in peace. BH at it yet again. When will this menace end? Is it now something Nigerians have got used to like corruption? Please the government should not go to sleep o. We need them alert and awake on this BH matter. May the departed rest in peace, Amen. @AgorasBlog: "CHANGE" for all, not just for Buhari, his family & #APC leaders. Buhari & APC leaders got what they wanted. Where's CHANGE for the masses? Boko Haram is still killing Nigerians, but Buhari and his family are cruising about in private jets. Where is justice? Where is fairness? Why can't Buhari understand that Boko Haram should have been exterminated by now? How many more people have to die before Buhari gets off his backside and carry out his duties and cremate Boko Haram sponsors? When will Buhari take the battle to Boko Haram sponsors? When will Buhari hang Boko Haram sponsor. What's happening in the northeast is totally unacceptable and should no longer be tolerated. 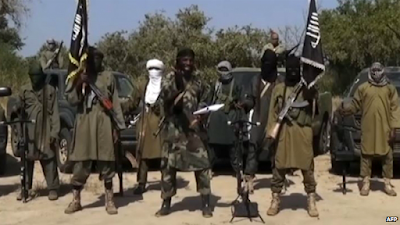 Buhari must defeat and exterminate Boko Haram. Enough is enough. They have murdered far too many people. There must never be forgiveness and no amnesty for Boko Haram. Boko Haram fighters and Boko Haram sponsors must be hanged. It will serve as deterrent to any other tribe or group that think they can destroy Nigeria. I'm surprised that with all the bombings and what not, there are still so many people in this borno state. What /w all the travels Buhari made, yet it is getting worst every minute. Nigerians shld demand 2 c the discussions in these meetings, especially in those countries bordering Nigeria. Was he trying 2 negotiate or seeking amnesty 4 BH, or was he seeking multiple pronged attack to destroy BH. We need 2 know. Unbelievable the way things r going rt now. Fresh attack by the day, may God save dis nation. Now that Buhari is D president you sound like a human being. When it was GEJ, you blamed him. Nakwa e check agwa njo gi. You said it all love you . Most nincompoop will always support whatever Buhari said. Ours so called corrupt PDP is better that this APC stupid,clueless baba go slow change. Nicki Minaj and Meek Mill taking a break?